ATLANTA racks can be continuously mounted. For the assembly of straight and helical toothed racks we offer special mounting racks. 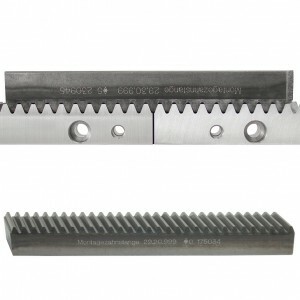 For the helical design, we offer companion racks, which are toothed in the opposite direction. In addition, a patented mounting system is available for the continuously assembly of precision racks. 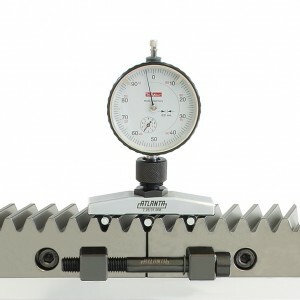 ATLANTA has developed and patented a measuring and assembly kit, which allows for precise adjustment of the gab inbetween racks segments, achieving extremely accurate, continuous mounting of the racks. Magnetic pins and adjusting device make it possible to optimize the ATLANTA racks to achieve a complete high-precision rack & pinion drive. The gauging rollers (patent) are placed in the tooth gaps of the already mounted rack, of the rack to be mounted, and in the gap at the joint. 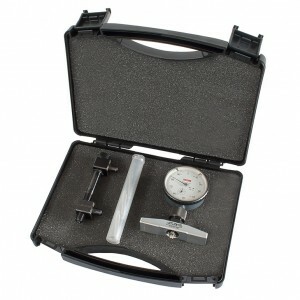 Adjust the measuring bridge on a measuring plate or other level surface to zero. Mount the adjusting device. By means of the measuring bridge and the adjusting device it is now possible to adjust the optimal pitch by moving the racks to be assembled. The pointer of the dial gauge should, if possible, reach the pre-set zero value. Here you will find different mounting videos.